Uruguay goalkeeper Fernando Muslera did a Loris Karius as he spilled an Antoine Griezmann effort for France’s second goal today. Les Bleus are now 2-0 up against the South Americans thanks to Griezmann’s speculative shot that somehow found its way in. This bizarre goal is certainly reminiscent of Karius messing up for Gareth Bale’s second goal for Real Madrid against Liverpool in the Champions League final. GOAL ?? A huge mistake from the highly experienced #URU goalkeeper! 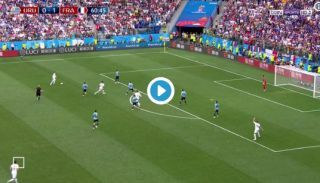 Has Muslera just handed #FRA victory?